Luxury Seating – We are taking comfort to the next level. Each auditorium houses leather, power-reclining seats to allow our guests to truly kick back and relax. Paired with our stadium style seating everyone has the best seat in the house. Monday Senior Specials –Every Monday is Senior Day at Emagine Frankfort. From open until 6PM all guests 55 & over can get a ticket for $5 and enjoy a small pop & popcorn for $5. That’s right, for a total of $10 you can enjoy admission to your movie, pop, and popcorn! No loyalty membership needed. Huge Screens – You will have a movie-going experience like no other when you see a film on our huge screens. With our large screens, and state-of-the-art projectors & sound system you will be captivated by the movie. Dolby Atmos EMAX Theatre – This is our largest screen at Emagine Frankfort, stretching from wall-to-wall and ceiling-to-floor. This special theatre experience also has immersive sound for an amazing audio experience. The Screening Room – The perfect hybrid of a big screen experience coupled with the privacy of your living room. Guests are given control of certain movie attributes like volume and house lights control, and the ability to pause the movie during a viewing. Reserved Seating – All theaters offer 100% reserved seating. You can purchase tickets online or on our app (available on Google Play or iOS App Store), and choose your preferred seat for the show. You will enjoy the opportunity to purchase tickets on our app and on our website. Theatre Bar – Hand-crafted cocktails and craft beers are available for guests 21 and up. 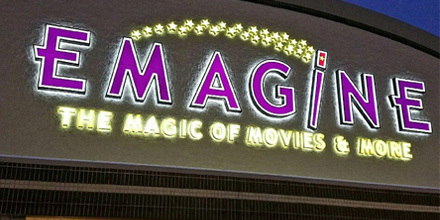 Emagine employees will even deliver drinks to a guest’s seat. In-seat Cocktail Service – For guests aged 21+, we offer in-seat cocktail service for films rated PG-13 & R, Friday & Saturday nights from 6:30 PM until 10:30 PM before the show. Handcrafted Pizzas & Poppin’ Olive – You can enjoy all of your favorite movie concessions or try one of our specialty pizzas made fresh on-site in a real stone oven. Our Poppin’ Olive popcorn is made with 100% Olive Oil and dressed with sea salt for a healthier version of everyone’s favorite movie treat. Self-Serve Coke Freestyle Machine – You may choose from over 100 flavors or grab a slushy drink for the same price as a soft drink. All soda and frozen beverage refills are complimentary. Birthday Parties – We do birthdays right at our theatres in Frankfort. Host your friends and family at your next birthday party and have an event that everyone loves. Private Theatre Rentals – Theatre auditorium spaces are available for private rental. Senior Mondays – $5 admission tickets for seniors, and $6 for a small pop and popcorn. No Loyalty sign-up is required. Loyalty Tuesdays – All day Tuesday tickets are just $5 and include a free small popcorn, available all day for all rewards members. Student Special Wednesday – All day Wednesday tickets are just $5 and include a free small popcorn for all Student & Faculty rewards members with a valid student ID, available in-theatre only.